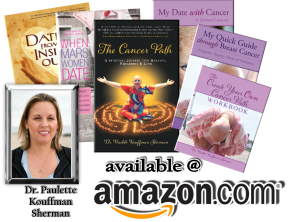 The Create Your Own Cancer Path Workbook is a workbook to help cancer patients keep track of their personal experience and story as they go through a most challenging treatment year. It is a journal/workbook with ideas, springboards and exercises so that they can remember how they got through everything, what and who inspired them, the lessons they learned, and other personal notes. They can use this workbook as a template for writing and publishing their own story later, if they wish. This can also be a legacy for their children, grandchildren, and great-grand children to learn from their story. 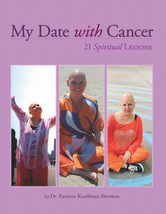 I found writing to be very therapeutic and research shows that there are many benefits to cancer patients from journaling and leaving a legacy behind. When I was in graduate school I learned about Michael White’s concept of Narrative Therapy. White spoke about the importance of our stories in creating our identity descriptions. He developed Narrative therapy to help people separate themselves from their problem, while externalizing their values, beliefs, behaviors, and ideals. This in turn makes the person more aware of subplots, themes, roles and possibilities in their story. Becoming the heroine of your cancer story allows you to reflect on what you’ve learned, what worked and didn’t work for you, where you could grow, the characters in your life and other relevant issues. It encourages you to take control over your life and story. Research shows that writing is therapeutic for patients with illness and cancer. One oncology study suggested that one 20-minute writing session may change how cancer patients think and feel about their diagnosis and have a positive impact on their quality of life. In Psychosomatic Medicine a study reported that HIV patients who wrote about their worries for 30 minutes a day for four days straight experienced a drop in their viral load and a rise in infection-fighting t-cells. In a small study at University of Kansas researchers followed 60 women with early stage breast cancer who had just completed treatment. These women were divided into three writing groups. One group wrote their deepest thoughts about breast cancer. The second group focused on positive things that happened during their breast cancer experience and the third group only reported treatment facts. After three months, the first two groups who wrote about their feelings reported one-third fewer symptoms and medical appointments than the third group who only wrote about treatment facts. Researchers at the Lombardi Comprehensive Cancer Center in Washington, DC revealed that expressive writing helped. They studied 71 adults with leukemia or lymphoma and had them journal while waiting for appointments. After writing, half of these patients said this exercise changed their thinking about their illness, and 35%,reported that writing changed how they felt about their illness. Researchers at Dana-Farber Cancer Institute and Harvard Medical School in Boston found that expressive writing or journal therapy may boost mental and physical health in patients suffering from cancer. We don’t need research to determine if something brings us therapeutic value. Personal experience is the greatest convincer. I wished that there were more journaling or narrative therapy groups offered in hospitals , and I intend to start such a group in Manhattan, but for those of you abroad, this workbook can allow you to start this process anywhere. 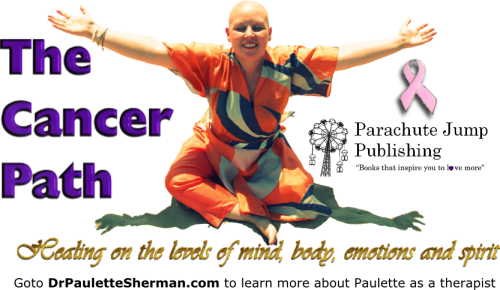 You can even start your own Create Your Own Cancer Path group with your cancer sisters!